Tech companies pour into automotive sector, vying for a piece of the assisted and autonomous driving market. Chip vendors and other companies that have little or no experience in automotive are flooding into this market as the race for assisted and autonomous driving begins to heat up. This market is expected to pay big dividends for companies that succeed in helping to build the vehicles of the future in this century. IC Insights earlier this year forecast the auto chip market would grow 22% this year to $28 billion, which is a record for the segment. In 2016, total sales were $22.9 billion, up 10.8% from the previous year. The market research firm more recently revised its 2017 total semiconductor market forecast, saying the entire semiconductor industry would enjoy a 22% increase in worldwide revenue, largely driven by soaring sales of DRAMs and NAND flash memory devices this year. The top global vendors in automotive ICs in 2016 were NXP Semiconductors, Infineon Technologies, Renesas Electronics, STMicroelectronics, and Texas Instruments, in that order, according to Semicast Research, with Robert Bosch, ON Semiconductor, Microchip Technology, Toshiba, and Rohm Semiconductor filling out the top 10. Those companies accounted for two-thirds of all auto chips sold last year. Qualcomm aspires to be No. 1 in auto chips through its proposed acquisition of NXP, which vaulted to the top through its purchase of Freescale Semiconductor, completed in late 2015. Qualcomm and NXP aim to conclude their transaction by the end of 2017, although NXP has acknowledged that closing the deal may come in early 2018, due to regulatory reviews, especially that by the European Commission—and barring a potentially hostile takeover by Broadcom, which made no mention of the NXP acquisition. Regardless of what happens between Qualcomm, Broadcom and NXP, McKinsey & Co. estimates the worldwide automotive industry’s revenues could nearly double by 2030, to $6.7 trillion from 2016’s $3.5 trillion. New-car sales will increase from $2.75 trillion last year to $4 trillion in 2030, the management consulting and business research firm forecasts. 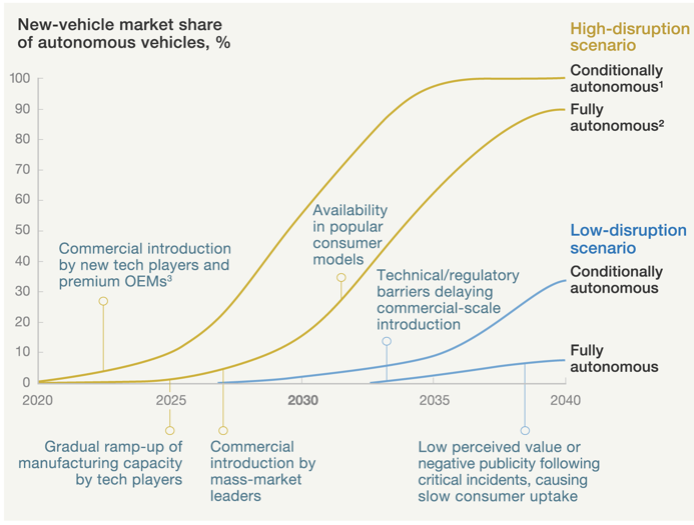 McKinsey sees four significant trends in automotive technology, all of which tie into electronics and semiconductors – vehicle electrification, increased connectivity, autonomous driving, and shared mobility services. “The automotive market has seldom experienced so many simultaneous disruptions. In the past few years, we have seen various technologies increasingly incorporated into the mass production of cars, including matrix LED lights, enhanced LiDAR sensors—those that use lasers to measure distance to a target—and better camera-based sensors. We have also seen improvements in 3D mapping applications, EV batteries, and augmented-reality technologies, such as heads-up displays. And 5G networks—the next generation of mobility solutions—could soon be available,” McKinsey noted this year in an article. Fig. 1: Two different scenarios for autonomous vehicle adoption. Source: McKinsey & Co.
Intel and Nvidia are fiercely competing to take the lead in automated driving technology. Alphabet’s Waymo business unit continues the work Google initiated in self-driving cars. To a large extent, this market is brand new. Assisted driving technology, such as adaptive cruise control, has been available as an option, but not as a complete driving system. That will change as the race toward fully autonomous vehicles takes shape. And those architectures will require massive processing power, arrays of sensors, ultra-fast communication, and a huge number of semiconductors, which is why there is so much interest by technology companies in this sector. There also are a number of different technologies and focus areas within this market that ultimately will need to work together as a complete system, including functional safety, computer vision, machine learning and artificial intelligence. In what is perhaps a sign of things to come, companies are beginning to introduce platforms that can be scaled for more compute power and to support a number of different applications within a vehicle. NXP’s S32 is a case in point, but certainly not the only one being developed for this market. “A common architecture and a scalable approach can cut development time for critical applications in domains like ADAS, autonomous driving or connectivity from both the hardware and the software perspective,” Luca DeAmbroggi, senior principal analyst for Automotive Electronics & Semiconductors at IHS Markit, said in a statement. Geoff Lees, NXP’s senior vice president and general manager of microcontrollers, also touted the chip company’s new i.MX RT series, a line of “crossover processors” for the Internet of Things, with applications in audio subsystems, consumer and health care, home and building automation, industrial computing, motor control, and power conversion. Geoff Tate, the CEO of Flex Logix, said eFPGAs are being targeted at the automotive market because they can provide the “long-term reliability” that is crucial for auto electronic components. Achronix, another eFPGA vendor, also is targeting automotive electronics, according to Steve Mensor, the company’s vice president of marketing. And Silexica, a startup that provides tools for analyzing and optimizing code for multicore processors, is adapting its tools for automated driving, domain controllers, IVI, and powertrain systems. Its tools can work with software for automotive electronic control unit, while also taking into consideration auto sensor fusion, computer vision, and deep-learning technology. NXP, Infineon, and Renesas can supply the fail-safe ASIL D chips, while other chip vendors are playing catch-up in that area, according to Venkatramani. The race is on to provide technology for this market. It’s likely that only a handful of companies will get the checkered flag, but it’s also not clear yet who those winners will be. What is certain is that there will be a lot of competitors vying for a piece of this market, and some interesting technology developments are likely to come out of these efforts that may be applicable to other market segments. As automakers rev up autonomous driving, cost cutting needs to happen at an unprecedented pace and scale—even for new technologies. After years of playing catch-up to multinationals, the country is targeting an opening with assisted and autonomous vehicles. A new crop of device makers are developing chips based on high-resolution radar technology for assisted and autonomous driving in cars.